The data train makes more or less its last stop before Fed Junction today, though given the ongoing uncertainty over the Brexit vote it seems very unlikely indeed that the station master will signal "full speed ahead" this month regardless of the outcome. Given the FOMC's uber-cautious approach it seems incredible, looking back on it, that the Greenspan Fed hiked in the immediate aftermath of Hurricane Katrina in 2005, but those were different times and a different Fed chairman. To be sure, the Fed isn't the only group worried by the Brexiteers. 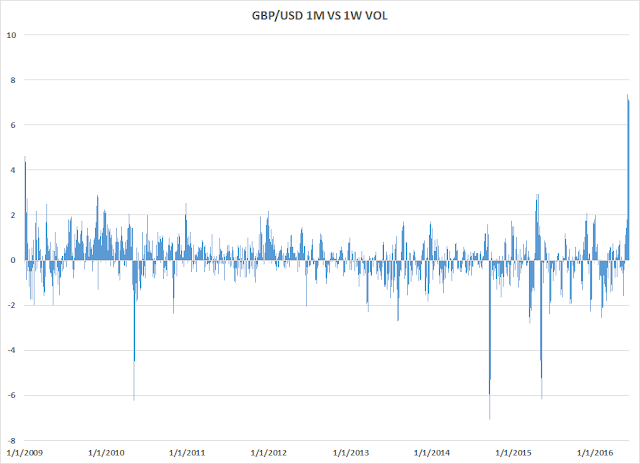 The vol market is now well and truly frenzied, with 1 month cable vol trading at a tasty 8-plus vol premium over one week. To put that in perspective, at the same point in the voting cycle that premium peaked at 2.9 vols ahead of last year's nail-biting general election and 1.6 vols ahead of the Scottish vote. Off the top of his head, Macro Man cannot recall another event that has commanded such a striking premium ahead of time. 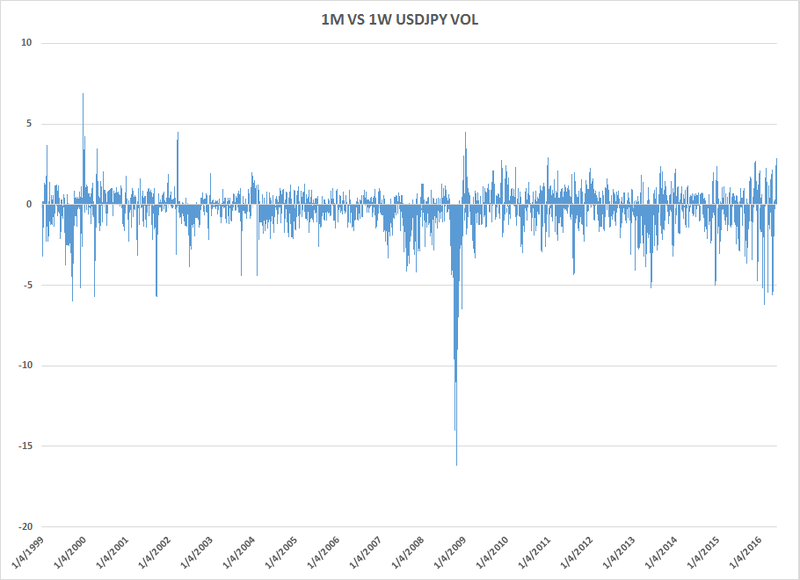 The equivalent spread in USD/JPY traded at 6.9 vols 8 days before Y2K, for those old enough to remember when the Millennium bug was a thing. Speaking of the yen, the reaction to Abe's consumption tax delay has probably not been what he was hoping for. The abrupt volte-face in USD/JPY and consequent drop in yen crosses must have the PM gnashing his teeth. Although USD/JPY is just at its midpoint of the last month or so, it is worth noting that some of the other crosses are achieving more notable milestones. CHF/JPY, for example, is now at its lowest point since late 2013. That being said, Macro Man doesn't see an imminent need to hit the panic button. Downside momentum in this cross at least is already waning, a divergence that often foreshadows a forthcoming bottom. And it's not like risky assets have been joined at the hip with the yen, either. 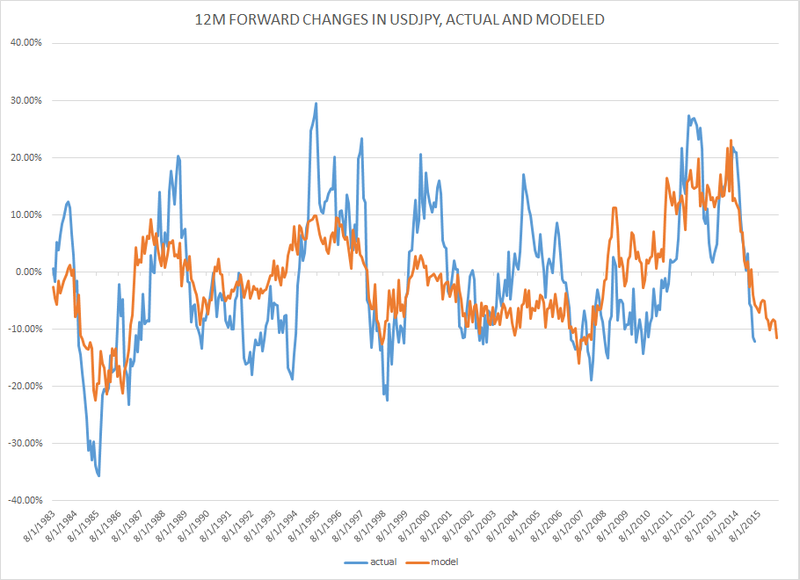 Finally, the weakness in USD/JPY at least looks justified; Macro Man's been playing around with a forecasting model, and after a first pass it's clear that yen strength is completely consistent with the (fundamentally based) forecast. As for payrolls, Macro Man's model looks for an increase of 126k this month, continuing the generally weak trend. Of course, the model doesn't know about the Verizon strike that's going to knock 35k or so jobs out of the number, so on an as reported basis this forecast is consistent with a figure of 90k or so. Of course, at this point in the cycle wage growth may well be a more important indicator than payrolls in determining the resilience of the labor market, insofar as its just not easy to add loads of jobs when the economy is running at something vaguely approximating full employment. If indeed it is, then we should see wages pick up, inflation pressures mount, etc etc. Stay tuned, and good luck. Generally, am on Nico's side in terms of how I view market. I think Emini is going to blow shorts out today into or before NFP. That H&S so many are talking about. Skr asked: "May I ask, What fundamentally could cause this to happen?" Please see MM's post above. JPY can extend its recent rally from here if, and these are big ifs for now: a) Tax hike in Japan stays on the table, at least for now, b) US jobs growth stutters (see MM post today), and June FOMC meeting fails to move the dot plots, c) Global economy (incl Japan) appears to be picking up a bit, reducing necessity for BoJ intervention. Our perspective is that a weakish NFP number is priced in here, the US economy probably recovered again from the Q1 dip. ISM has flirted with 50 but not dipped below (remember TMM's Law of ISMs, there shall be no tightening with a sub-50 ISM). The Fed's message machine is screaming July, then ONE MORE, and the markets are a little bit behind the curve. We anticipate that we will return to a long yen position, but not today. As of now it seems that a VERY weak NFP number will drive USDJPY lower. That has been negative for equities, and since we have some IWM puts, we are covered there. Btw, anyone who thinks oil trades on fundamentals is smoking crack and has to take a refresher on correlations, carry trades and market distortion induced by asymmetric use of leverage. Lots of leveraged longs here, just as there were a lot of leveraged shorts into the lows earlier this year. That group can, and indeed has to, turn on a dime when the momentum shifts. Wow. 38k..... that might make the JPY run on a bit. Not very growthy, there. Now what??? The bond market was on the money once again, it appears, at least at the long end. U-3 down to 4.7%, so there are two ways of looking at these data. Is this "Full employment" by the Fed's definition? @Left - the great US economy expansion cycle of 2009-2016 is coming to an end - more than a few bets have been placed on it to continue, as usual. As for the dollar - weakness vs yen, of course. Other than that, just remember the dollar rallies in two scenarios - 1) when the party won't stop in silicon valley - been there done that, and 2) on the way to the ER as the vomiting begins. And of course, as usual, there will be twists and turns, we will see - expect a lot of 'the fed is in a bind' type headlines, but I am beginning to think Ms Yellen may be pulling a trichet and cutting rates soon, with the exact opposite effect on the dollar that people think. Employment was bound to post a low number at some stage. But then again higher oil prices were probably the only thing keeping ISM earlier this week from 50. Mixed data really. As Washed suggested this could be the excuse for Yellen to take a detour to the toilet to vomit up the recent hawkish talk before the June meeting. So I am still thinking dollar correction for the rest of the month. @Booger I think you may have missed my point - I think the window for the dovish fed leading to dollar weakness may be nanoseconds in the scheme of things - I am more inclined to back up the truck on aforementioned weakness than to position myself for it. MM and LB, thanks guys! Washed: perhaps you are right, but I am thinking this could be a very tradable correction for at least a few weeks. I think gold could get to $1300 at a minimum. Perhaps the higher probability play would be to go long the dollar index after the correction, but why not do both and play the correction also ? I think once the dollar corrects, short SPX could in fact be more profitable than the dollar play. A stinker. Good call on the "low-ball" MM. And LB's USDJPY/long bond coming in nicely here indeed. DXY bulls also taking a bit of heat today. I can't believe that bunds are where they are, but I am a broken clock. Best ignore me. Hot lamp on Yellen on Monday! Ugh. Tough to trade this except to fade one or more of the big moves? The Euro seems like the obvious pink flamingo. Washed's point (buy the dip in the USD anyway) is that if the US economy goes in the crapper (which we don't believe to be the case) then USD (and the long bond) rallies anyway on risk aversion. The stagflation scenario is much harder to deal with (not 70s version but a kind of 2% Stagflation Lite), as stocks and bonds don't do very well while inflation creeps up and employment slides down [based on a standard inventory-driven recession]. Good call MM. Unfortunately this was not the outcome I was looking for. Cut away FF shorts and DXY long quickly quickly ... time to wash the face and re-think here. 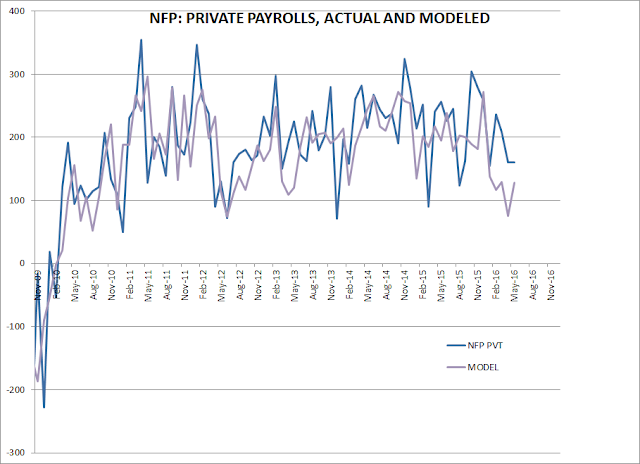 It might be a one time extreme pooper, but NFP trailing average is steadily going down as the job market nears its saturation point. Maybe it's partly resulting from the earlier occurred declining profit margins which are starting to kick in now. MM is on the money, wage growth is much more important and its still healthy. It needs to stay that way or else it might be easy to conclude Fed has missed the normalization bus. This at least seems to be the story what the long bond has been trying to tell for ages now. I doubt the Fed looks at these things they way I do...I see Bill Gross is banging the drum again for rate normalization. I'd have to agree. Why is it hard to visualize that ZIRP causes a decrease in the velocity of money in the working population? Because it is contrary to what economists thought would happen when they instituted it at the beginning of the GR? Does no one rethink policy, can they not at least consider the theory might have a hole after this many years? LB "Ugh. Tough to trade this except to fade one or more of the big moves?" Fade away. Its been the simple rule re Fed and Brexit. Fade consensus as the next data input will swing it. At the end of May we had Fed a definite hike and Brexit a definite IN. And both are not so sure now. Few days ago everyone mentioned how a reasonable jobs number would mean a possible hike in June - yet MIRACULOUSLY we have the worst print since I can't remember how long. Coincidence? Yeah sure... welcome to our centrally planned economy and markets. the most amazing thing to me is that for all the handwringing in the media over why the fed should not hike in the light of this report, no one is asking the obvious question - how does it matter what the fed does if after 7 years of ZIRP the economy, apparently, does have the ability to slow down all by itself. Bad News might still be Good News for some punters, but if the punchbowl really is going to be taken away, in the face of some renewed economic weakness, then there will be nothing holding this market aloft - even as it hovers in thin air at an elevated multiple, in a state of suspended animation. The same is also true for some of the commodity and energy space. Imagine a Monday where punters think that the US might actually be slowing down, but they are expecting to be nursed back to health by the mother's milk of Fed dovishness? What then if Dame Janet decides she doesn't feel like putting out and that The Lady Is Not For Turning? A July rate hike is definitely on, unless something quite extraordinarily bearish happens between now and then. Presumably one of those things might be Brexit or a disorderly Chinese devaluation. Regarding the jobs number, we have said many times here it is a lagging indicator, and the PCE number is more important as a coincident indicator of inflation for the FOMC. Hours worked and hourly wages were flat, so there are elements of the report that are no worse than neutral from the perspective of the Fed. June is off the table, but it always was, if we had indeed been listening to the Fedspeak. One way or another, we can't escape the conclusion that we are watching a simple inventory-driven mild slowdown and profit recession colliding in super slo-mo with a modestly tighter monetary policy in the US, and that once the momentum monkeys and algos start singing from the same hymn sheet, this equity market can take a very ugly turn. As a short term trade we fancy short EURUSD a lot here, but we are going to wait for Monday morning's follow through. Are you lot seriously thinking the SPX will fall???? @left I more or less agree - I think yellen will be hawkish on monday, and is more likely to say this jobs report is an outlier so market should be prepared for rate hikes. Why? Pretty simple - spoos allow her to, and she is not an idiot. Its quite obvious the feds reaction function is to where equities are, to the exclusion of everything else. The more interesting question is what Nikkie does sunday night in the face of yen strength. Its been marching to its own tune lately, but global equity correlations will come back at some point I think. re washed- agree have bought some weekly puts on es-at 2100 here. I don't know, washed. I was looking for the hawkish steer Monday too, but the May payrolls, plus the April revision, plus the sizable ISM services miss, and all against a backdrop of weakening global PMIs ... it's too much. And Brainard on the tape with dour comments on the labor report and the Q2 data is now seen as "mixed" .. it's likely going to take more than a month's data for the Fed to get its confidence back after this. I'd have put higher odds on a June hike yesterday than I would put on a July hike today (though the market had the former at 22% and the latter is 27%). johno - my whole point is they desperately want to raise expectations of a hike if equities allow them to so they can avoid surprising the market. In that sense she is fighting the short end bulls more than anything else - people really need to stop thinking the fed cares about the real economy when it comes to this decision - everything they have said since q3 2014 screams out at me they think the biggest risk to the economy is a severe equity selloff, and the 'risk management' of that is their top priority. I frankly don't even disagree - the last two decades have repeatedly shown the difference between borderline data and recessionary data is equity valuation - this time of course there is a new twist in terms of dovish room being so limited, QE being politically charged, and corporate bond purchases not yet on the radar other than ECB. On that last point - be wary of the ECB purchases that start June 8 - I wonder if buy the rumor sell the news applies to that asset class just like it did to govt bonds - credit has certainly been on a tear since the announcement, and trust me the oil rally wasn't the only reason. Johno - that's a good point about ISM services and Brainard, but with respect, I don't think that it's really that wishy-washy here, b/c at some point, even a Fed as dovish as this one is going to say "for Heavens' sake, Mr Market and US economy, grow up and stand on your own two feet!". Let's look at the data, not the markets for a second. U-3 unemployment is now at 4.7% and Real Inflation experienced by Real People is likely between 3 and 4% at the moment and after all, it's an election year. It's time to spread the wealth to the savers and renters who have been sorely abused. It's clear this Fed has shown a tendency to pre-determine its moves and then not to waver. As examples, the Fed created the Taper Tantrum, which previewed the Tapering, which was well advertised and then delivered (this was while Dame Janet was an understudy to Big Ben). Then we had the very well advertised in advance December hike. Lately we have had very clear hand signals regarding July, and I think that the July hike is also going to stick. In fact, I think they would definitely go in June were it not for the UK referendum being so close. We have trimmed off almost all of our REIT common shares, holding only the preferreds. Ownership of the REITs and the mREIT group in particular has again been passed to yield-hungry retail participants who know not what they do. The summer will bring a buying opportunity for other cash rich Yield Hogs, as is so often the case. Started EURUSD short, expect to add to it Monday. Congrats to anyone who held their yen longs through this morning!! As Tim Duy, the latest Yellen mouthpiece tweeted "On the plus side, now we don't have to spend the next 2 weeks stressing about the outcome of the June meeting." I am skeptical about a rate hike in July either and I think Duy is about right that September or later is what should be priced in. Which is why I have been very skeptical about any substantial dollar rally before another significant correction. Having been on the receiving end of previous dollar corrections, buying into rate hike talk in this environment is like an elastic band to the gonads. Sharp and painful to be long dollars when the rate hike gets taken off the table, and how many times has that happened ? Strategically, I think Yellen is one of the better Fed heads in forecasting economic data. She would be aware that the data is quite mixed here. Yes employment is good, but it is near an all time low unemployment rate in Japan too! The main problem is inflation, or lack of it and lack of GDP growth due to a mountainous debt load everywhere. On a short term level, US PMI recently ok, but mainly buoyed by rising oil prices, which could easily reverse, NFP weak yesterday and last month, services PMI weaker, temp employment weakening for the last year, housing starts strong but permits weak. Basically, not the stuff to be hiking in an election year. Career risk is very high here for Yellen, if she hikes in July. I think she would be aware that there is a high chance that whatever she announces in July, SPX is likely to head down thereafter. If she takes the bait and hikes then the market really could tank. If she does nothing then it will probably pop 1% then tank. So the least risky thing to do is nothing. The career risk from hiking in July and then having to take that back later in the year, in an election year must be a factor. I think the optimal choice for her is to stay pat and hope risk assets stay afloat until inflation ticks up further. The main risk for her is that risk assets (i.e SPX) start to fall apart even without a rate hike. There is a risk that risk assets go into bubble mode from here but with the rest of the world slowing, one would think the chances of that are low. Anyway, no one can see bubbles forming anyway, so that has not been a problem for the Fed since Greenspan. I stick with my idea that eur.usd can get to 1.18, aud.usd 0.8, usd.jpy 102, oil $55 and dollar index 90 before we find a true bottom and good place to load up the truck on long dollar/short risk positions. eur and aud I think have potential to rally because the ECB and RBA have already acted and with current forecasts will be out of the game for rate cuts until the end of the year. So they are prone to nasty reversals based on diminishing US rate hike expectations also. The Fed are currently making the biggest mistake in their history. Boosting asset prices via ZIRP and easy monetary policy means we are already in a bubble for financial assets and property (worldwide). Growth has stalled due to structural problems and high debt. At some point we have a major recession; the longer we go without a recession, the bigger a recession we have when it arrives. At that point central banks are out of ammo. The Fed want to raise rates now to have some bullets left, but short-term political pressure is making it difficult for them to do so. This is the beginning of the end. I think the best policy is to keep buying dips in risk assets, store all profits in physical bullion and wait until the carnage begins. Once it does, liquidate all positions instantly and watch the house burn down. The crash that follows will make the GFC look like a picnic in the park. Mainstream politicians, central bankers etc will be imprisoned (or worse), and the system will reset. This is the optimistic scenario. Market commentary is interesting, especially the politicization of central banks and the like. Also interesting is the political change in the mainstream economy. At this juncture I will say I am no fan of Mr Trump, BUT yesterday I had the misfortune to see video and photo footage of a dozen or more angry male thugs threatening, attacking & abusing an innocent woman purely because she supported Trump. At the same convention, a lone man was attacked, blood pouring from his head - his crime? He was a Trump supporter. The police in attendance did nothing. Since when was it ok in America for a crowd of violent males to attack an innocent woman because she voiced support for a political party? If you think this post has nothing to do with markets, you are burying your head in the sand. This country is severely dysfunctional, the economy likewise and financial markets also. In fact all are inter-twined. I fear for the future, not because of 'radical' leaders like Trump, but because of 'mainstream' political leaders, central banks and the politically-correct disease, incentive structure, and corruption that is destroying our society, economy and markets. Lord Adair turner on debt from a recent cfa conference. I've been meaning to read his book but haven't had the time. Curious to hear if anyone has. Is a rate hike six months after the first not gradual? The global pensions crisis has been laid bare by new analysis that shows people retiring today can expect half the income of those who became pensioners at the start of the millennium. The stark findings by the Organisation for Economic Co-operation and Development (OECD) will be presented in a report this week that highlights the impact of ultra-low interest rates on global retirement incomes. It shows that a person buying an annuity today who saved 10pc of their wages into a pension for 40 years can expect just over half the earnings of someone who saved the same amount but retired 15 years ago. 1) if everyone is focused on downside risks, htf are we at near all time highs? Either people don't say what they do, or short covering results in much greater capital inflow than fund buying - you could just as well describe market sentiment as 'anxious' where fear of missing out the upside brings us to the highs and then the actual risks hit home periodically, instead of describing the sentiment as 'unduly pessimistic' - small semantic shift, but very different implications. 2) if the foreign cash of $2.1 TN comes home, doesn't it hit foreign stock markets as much as it helps the US? Also, this tsunami of repatriation is pretty bullish the dollar, no? Is the net impact really that positive? Feel like best case it may help tech buybacks at the expense of foreign assets. I really feel like spoos are desperately looking for an excuse to go make new highs for 2 years now and keep meeting reality instead - I don't see why that can't continue, FWIW, but the idea that the market is overly bearish and that keeps propelling us upwards, in an asset class thats 97% long only, is garbage.